I have a terrific parenting book that is full of tips for handling the toughest situations – it’s The Worst-Case Scenario Survival Handbook: Parenting. Although intended to be tongue-in-cheek, the book is actually very practical. When I first got it, the chapter I turned to immediately was ‘How to Survive Baby-Gear Overload’. Our first travel experience with a baby shocked me – so much stuff! And all of it was deemed ‘essential’ (we were newly minted parents). Which is why Rock-a-Bye Baby’s Sydney Airport Concierge Service is a godsend for travelling families. Rock-a-Bye Baby is a hire service for baby and kids equipment. They have everything from prams and baby hammocks to car seats, change tables, highchairs and portacots. 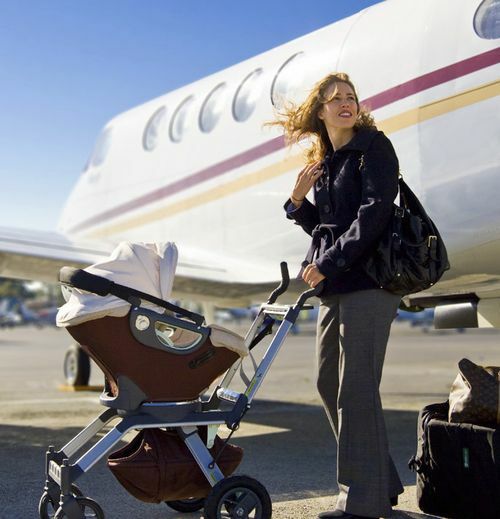 Here’s the really good bit – if you are flying into Sydney Airport and plan on hiring a car, Rock-a-Bye Baby will have your car seat, pram and portacot ready in your car for when you land. Or, if you have family or friends on airport duty, have all your bits and bobs delivered to their home prior to your arrival – yes, it’s that simple! It’s worth noting that all car seats and capsules are installed by professional restraint fitters prior to your arrival which is a darn sight better than our first car hire experience with a baby – we were handed the keys to the car and the car seat. Having always had our car seats professionally fitted, doing it ourselves was a stressful start to our holiday. Prices range depending on what you need and for how long – a ‘Traveller’s Package’ comprising a car seat, pram, portacot and baby bath is just $125 for two weeks hire. A Quinny Zapp stroller costs $45 for seven days hire and car seats begin at $35 for seven days. Contact Rock-a-Bye Baby directly for hire rates. As a footnote, The Worst-Case Scenario Survival Handbook: Parenting suggests the following to remedy gear overload: wear cargo pants with lots of pockets, dress baby in cargo pants as well, wear a photographer’s or fisherman’s vest with lots of pockets, wear a bum bag, a webbing belt and a baby carrier. Lots of pockets or not, there’s nowhere there for a portacot, a car seat and a pram so a Sydney holiday is looking pretty good, isn’t it? !